On this episode of STAGE GROK, I talk with Todd Schaefer, actor, director, designer, and teacher, about approaching the character of Capt. 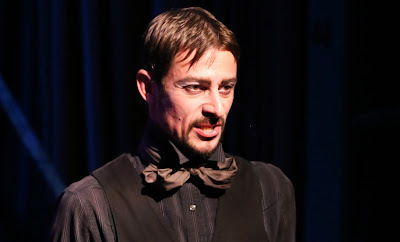 Macheath in New Line Theatre's production of The Threepenny Opera. We discuss his creative process and what was so different about working on Threepenny. Todd is also artistic director of The Players Project Theater Company in St. Louis, and the drama teacher at Webster Groves High School. Todd as Macheath. Photo credit: Jill Ritter Lindberg.